In the Feudal System there were different levels or ranks in the system The king owned all the land. He was also the one responsible for giving grants of land to his supports. 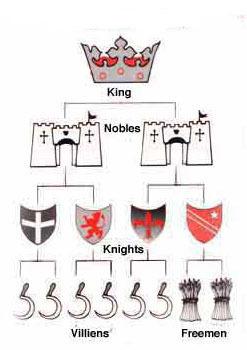 The Nobles were also known in the same categories of barons and bishops. They had to provide the king with a number of knights, money, advice and a place to stay while traveling. The lords had to supply with a manor and had to provide one knight to the king. Villeins receive land and in return received working in the lord’s manor. They weren’t given the right to sell their land. Serfs had no land and had to work for the lord.